Henry Brown (1843-1891), Past Grand Master – Temple Lodge, No.33, Duncan, B.C. 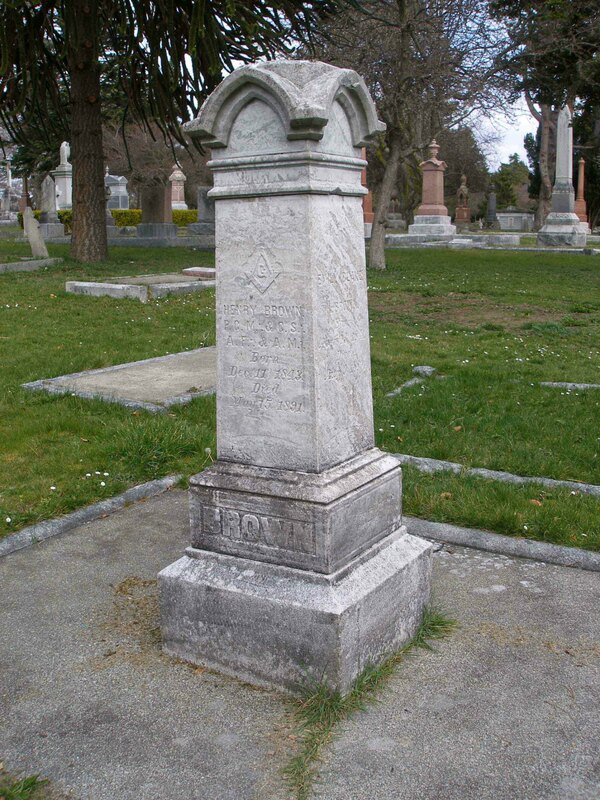 As part of our Vancouver Island Masonic History Project and our series on Vancouver Island Cemeteries – Masonic Interments and Deceased Brethren, here is a page on William Brown (1843-1891), Past Grand Master. Henry Brown is buried in Ross Bay Cemetery, Victoria, B.C. “Death of Mr. Henry Brown – Henry Brown, of the old established dry goods firm of Brown & White, died at his residence, Fort street last night. Mr. Brown had an attack of la grippe about a month ago. He was recovering, but ventured out too soon, with the result that he got a relapse. Erysipelas set in and he gradually grew worse, and since Monday last was in a comatose condition. The end came shortly after 10 o’clock last night, when he passed peacefully away. Henry Brown was a native of Nottingham, England, and was aged 49 years. He came to Victoria in 1862 via Cape Horn in the ship Tynemouth, and spent a short time in Cariboo. Returning from the [illegible] he entered the dry goods business, in [illegible] he continued up till his last illness, being in partnership with Mr. White for the past twenty years. About two years ago he was left a widower, with two little children – a boy and girl – who are now bereft of father and mother. The Tyler with drawn sword. The Holy Writings, carried on a cushion, covered with black cloth, by Bro. Broderick. The body in a coffin covered with the insignia of the deceased’s office, on each side the pallbearers. The pallbearers were: Right Worshipful Brethren Past Grand Master E.C. Baker, Past Grand Master W. Dalby, Past Grand Master G.R. Milne [sic], Past Grand Secretary H.F. Heistermann, Past Grand Master J.S. Clute, Past Master Teague, Past Master Shotbolt, Past Master Mitchell. Henry Brown is buried in Ross Bay Cemetery, Victoria, B.C. Henry Brown, Past Grand Master, grave in Ross Bay cemetery, Victoria, B.C.